Episode 3 English. Cand is short for candle. Unless he is replaced with another Rookie Digimon, he cannot be sent to the Dark Area. He skillfully jumps around on his pedestal foot and does a strange little dance! Has the powers of "sky" and "fighting"
Unless he is replaced with another Rookie Digimon, he cannot be sent to the Dark Area. 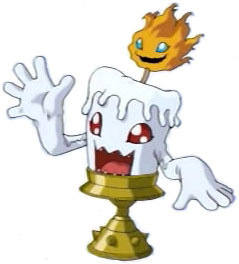 It seems his true form is not the candle, but the DigiCore that burns on his head. Has the powers of "sky" and "underground"